Andrew Carnegie funded 1,681 public library buildings in 1,412 communities between 1889 and 1923. His philanthropy had a great impact on public library development in the United States. Free public libraries supported by local taxation had begun in Boston in 1849 and had spread slowly throughout the country. Carnegie attached two conditions to his offer: the local community had to provide a suitable site and agree to support the library through local tax funds. Oroville Carnegie Library, designed by William Weeks, is one of thirty-six Temple Style Classical Revival Carnegie Libraries built in California between 1903 and 1915 and one of eighteen still standing. Oroville's library history dates back to an 1859 early mining town library, one of the few to survive and be listed in the 1876 national survey. Also listed were Placerville, Nevada City, and Knights Ferry. 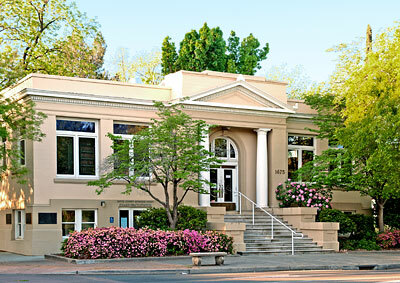 When we photogrphed the building in April 2013, it housed the Butte County Public Law Library and the Oroville SHARP Facility.